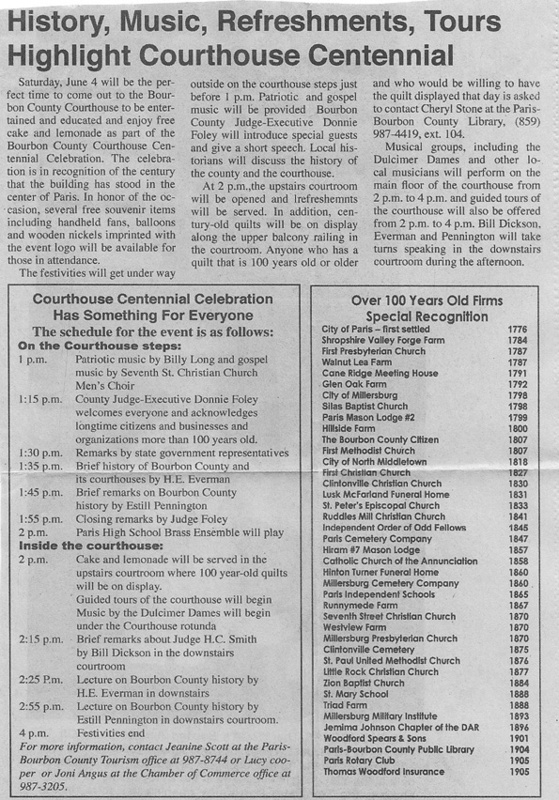 Newspaper article: The Bourbon County Citizen. Bourbon County Courthouse Centennial, lists local businesses, etc., and when they were begun. Certificates were passed out for masons, lodges, bussinesses, churches, library , farms, Duncan Tavern, funeral homes for being in the county for 100 years. 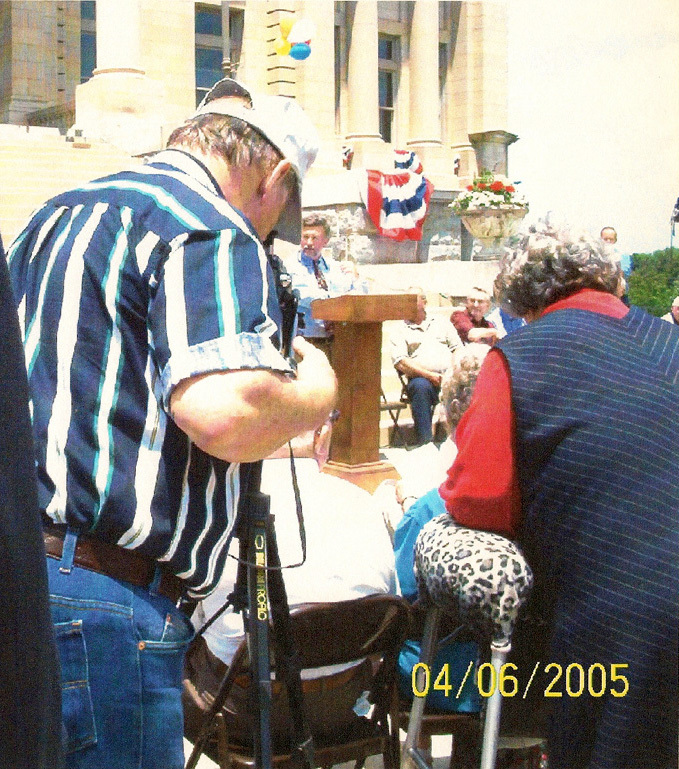 April 2005 Courthouse celebration also provided an opportunity for politicians to speak at the Courthouse steps, folks to take photos, and to celebrate the past with a display of old-time transportation on the Courthouse lawn. Cake was served in the Courthouse. The buggies are ca. 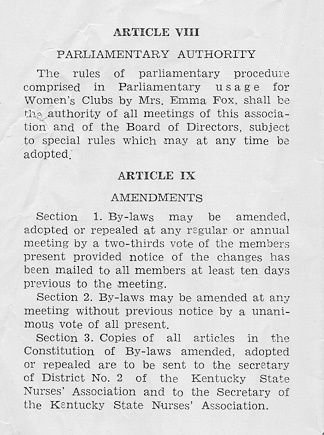 1900-1905. 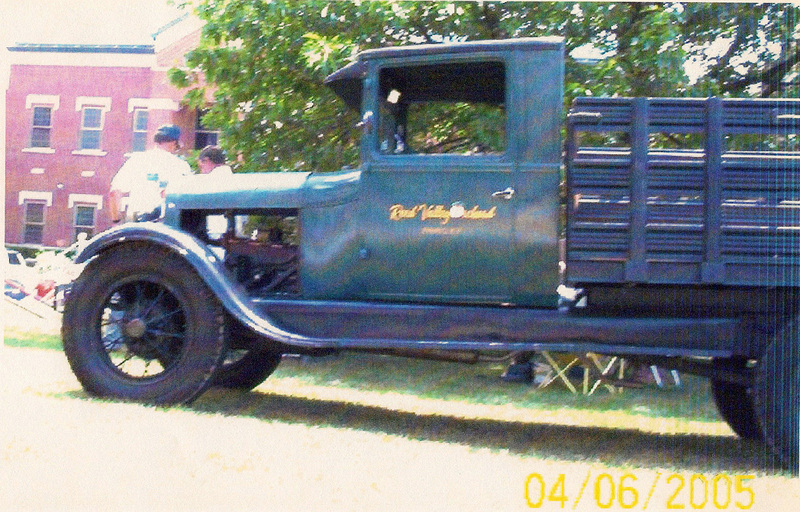 Old Truck from Reed's Apple Orchard. Current Bourbon County Judge speaking. 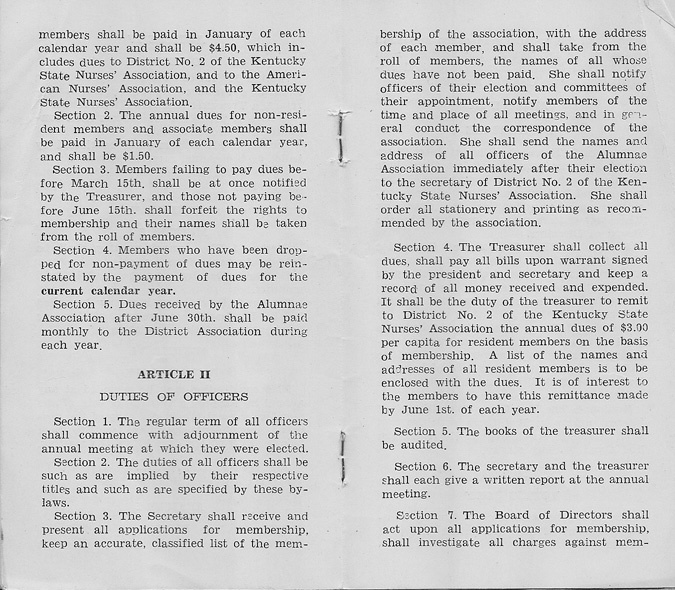 The Kentuckian-Citizen, exact date unknown. 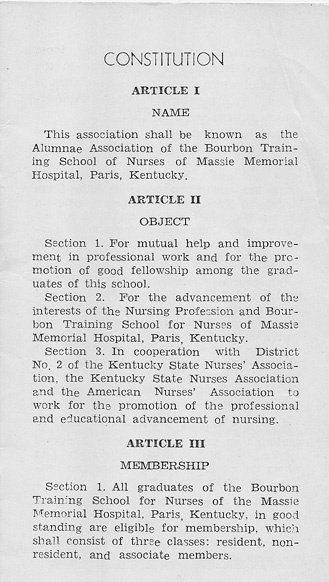 The author was Mildred Curtis Mastin, a 1939 graduate of Massie Memorial Hospital nursing program. 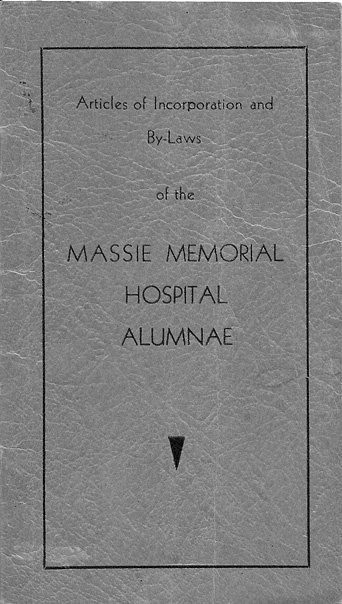 Articles of Incorporation and Bylaws of the Massie Memorial Hospital Alumnae. 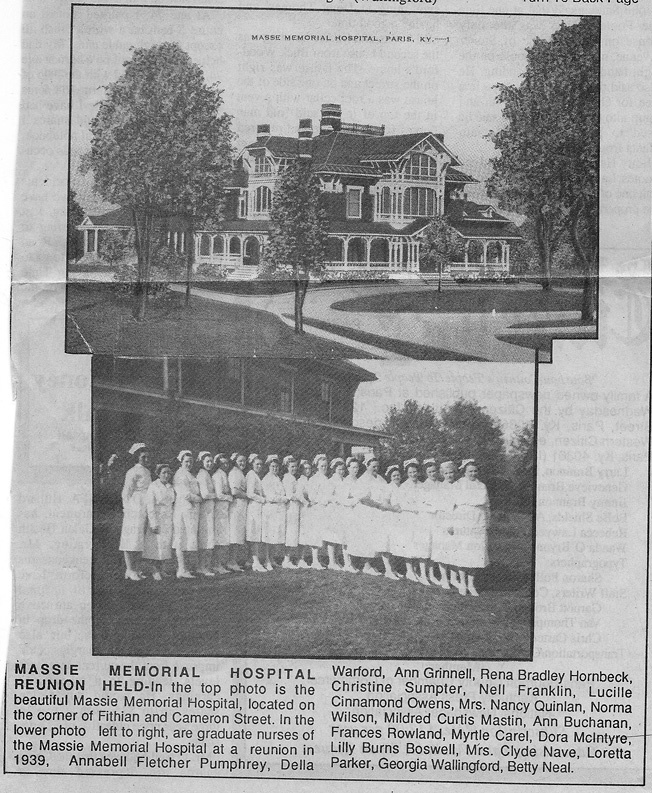 There was a Nurses Home, which is still standing. Mr. & Mrs. Phil Clementis, jr.
--- Miss Georgia Moore Rion died Tuesday night at the home of her father, Mr. Wm. N. Rion, on Fifteenth street, this city, of tuberculosis. She was 22 years of age. She was a member of the Christian church and much beloved be a large circle of friends for her beautiful Christian character. She is survived by her father William N. Rion, and six sisters, Mrs. Quisenberry, of Winchester, Mrs. H. L. Terrell, Mrs. Harvey Rose, Mrs. R. L. Whaley, Miss Sena Rion and Miss Aradella Rion, and one brother, William N. Rion, Jr. The funeral services were held yesterday at the residence at 3 o'clock p.m. Services by Elder Carey E. Morgan. The interment was in the Paris Cemetery. The pall bearers were Wallace Clarke, Jack Casey, Taylor Chandler, Richard Butler, Harry Linville and Chas. Fithian. 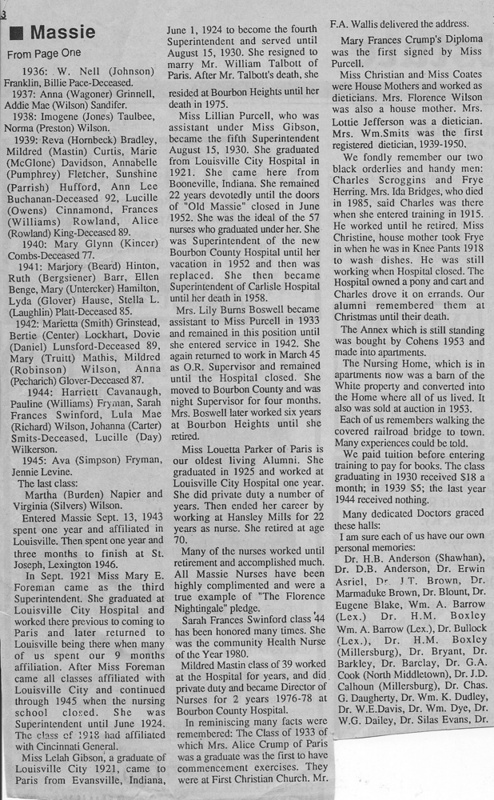 --Mr. Samuel L. Weathers, a pros -perous young farmer of Clintonville, this county, and Miss Mattie Lea Stipp, and attractive young woman of same neighborhood, stole a march on their friends, went to Lexington and were quietly married in the parlor of the Phoenix Hotel Wednesday evening at 8 o'clock. Rev. Mark Collis, pastor of the North Broadway Christian church officiating. The wedding was witnessed by Messrs. Thomas Weathers and Oscar Davis and Miss Lena Davis, who accompanied the bridal couple on their trip. 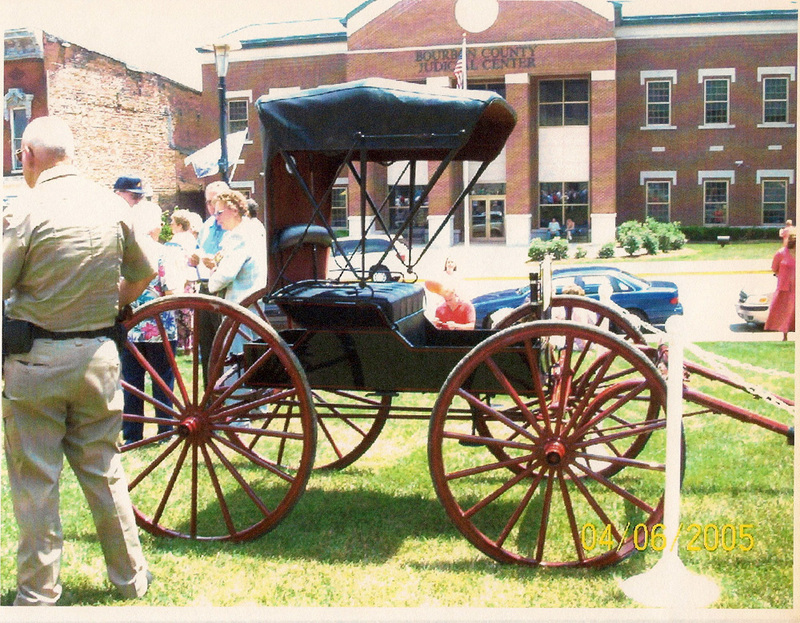 The party arrived in Lexington on the 5 o'clock interurban car, went immediately to the office of the county clerk and procured the marriage license. The happy couple returned to Clintonville yesterday where they will make their future home. ---Miss Pearl Ely and Mr. Joseph James will be united in the holy state of matrimony at the home of the sister f the bride, Mrs. M.H. Highland on Vine street, this evening at 8 o'clock. The Rev. Geo. 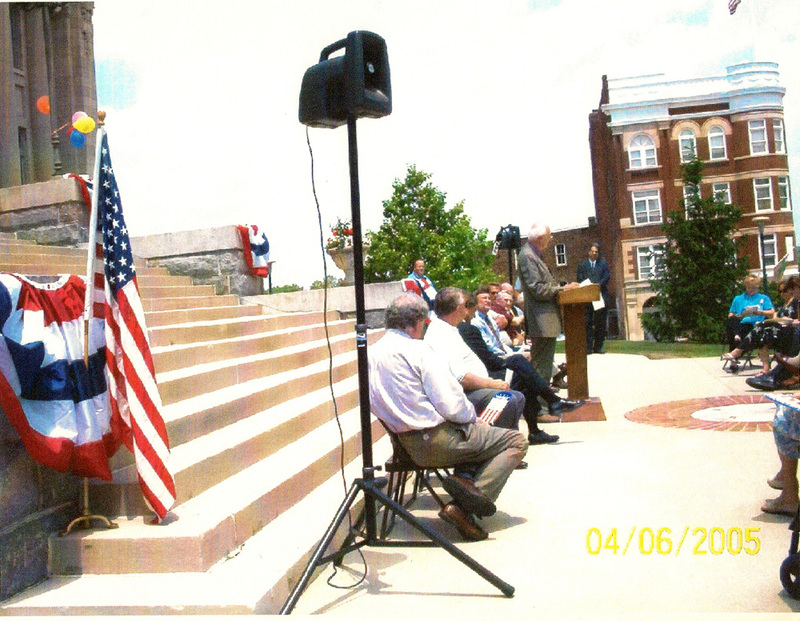 W. Clarke will perform the ceremony. The to-be-bride is a popular clerk at Mr. C.S. Goldstein's dry goods store and a most excellent young lady. Mr. James is a genial and agreeable salesman with Mr. C.B. Mitchell, who has a host of friends who wish him a happy and successful future. announced by the happy couple on Wednesday last. The bride is the daughter of Mr. and Mrs. Albert Rice, and the groom a son of Mr. and Mrs. John McCord. They have gone to housekeeping at the home of the groom on the Ruddles Mills and Millersburg pike. ---Miss Mattie Moore and Mr. John Curd of Harrodsburg, were united in marriage Wednesday at 2:30 o'clock p.m., at the residence of the officiating minister, Rev. J. H. Williams, at Little Rock, this county. The bride, who is pretty and attractive, had for several days been the guest of the Rev. and Mrs. Williams and after the ceremony the happy couple drove to Paris, where they were tendered a reception at the home of the bridegroom's sister, Mrs. Chas. Funk. ---Mr. James Delaney, aged 71 years, died Thursday night at his home on the Clintonville pike of general debility. Mr. Delany was a native of Ireland and came to America when a lad thirteen years old. He lived the most of his life at Lower Blue Lick Springs moving to Bourbon eighteen years ago. 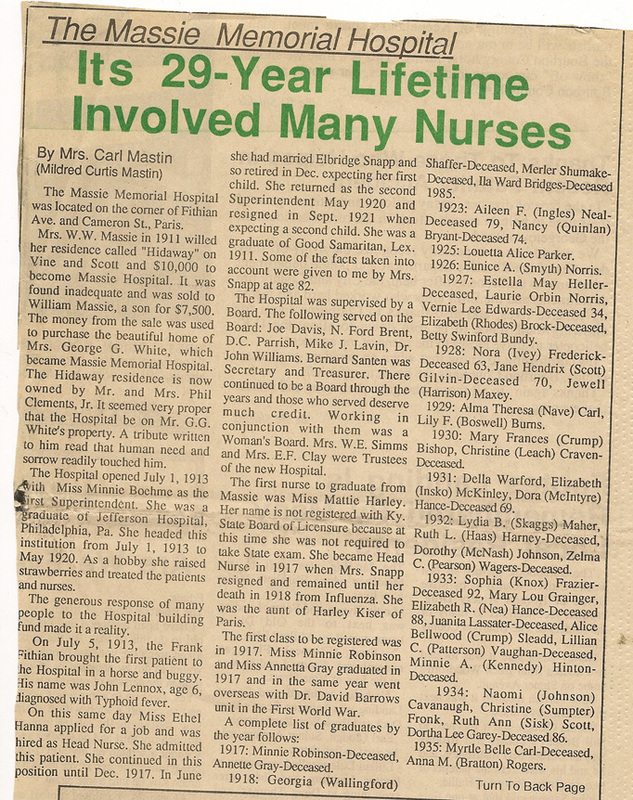 he was married to Miss Mary Elizabeth Conyers an besides his wife is survived by nine grown children, five sons and four daughters, all being at his bedside when he passed away. The funeral services were considered at the Catholic church Saturday morning at nine o'clock by the Rev. Father Eugene DeBruyr. The interment in the Paris Catholic cemetery. The pall bearers were T.F. Brannon, John Toohey, John T. Doyle, John Connell, Eli Goughlin and James Burke. ---The funeral services of the late John A. Trimble were held at the Christian Church in North Middletown Friday at 2 o'clock p.m. Elder J.W. Ligno paying just tribute to his memory. Mr. Trimble was a son of Fargus and Eliza Trimble, both of whom came to Kentucky from Virginia in the early history of the county and settled on the Plum Pick pike, where they reared a large family of children, four of whom survive---Mrs. Sallie Collins, of North Middleton, W.G. Trimble, who is now convalescent in a Lexington hospital, R.L. Trimble, of Sayre, Oklahome, and Mrs. Perlina Allen. Mr. Trimble's mother was a second cousin of George Washington and often told of incidents in the life of the Father of his Country. Mr. Trimble married Miss Laura Harmon, whose parents resided in a neighboring farm. She died in 1903. 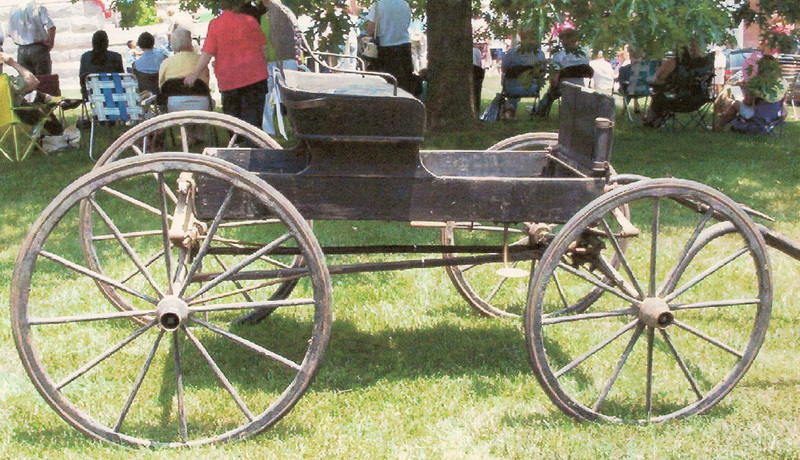 Mr. Trimble was prominent as a farmer and business man and died at the advanced age of 75 years. He is survived by two sons, Albert S. Trimble of North Middletown, and Kirby Trimble, of Oklahome, and four daughters, Mrs. Lula Bunnell and Mrs. Ella Trayler of Scott county, Mrs. E. L. Harris of Paris, and Mrs. Roger Burris of Little Rock, this county. Mr. Trimble was laid to rest in the family burial lot in the North Middletown cemetery. 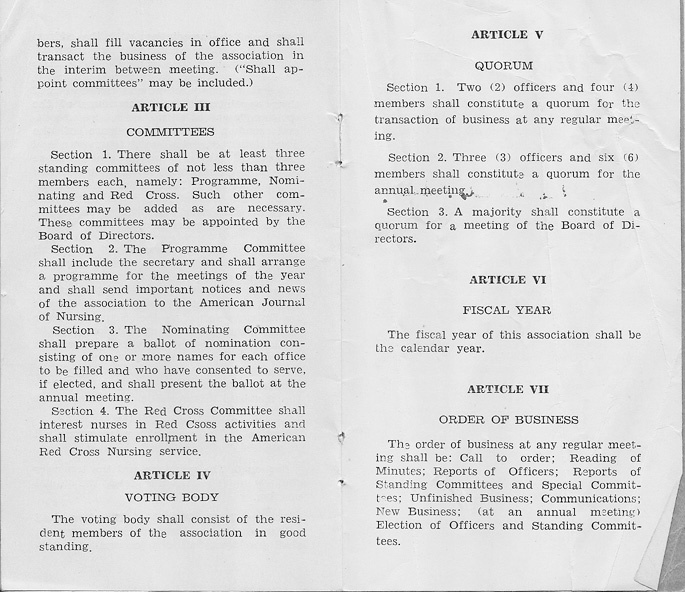 The pall bearers were L. D. Young, W. S. Jones, R. D. Weaver, G. L. Rice, J. W. Young, J. W. Prescott, Ed Rice and T. J. Judy.